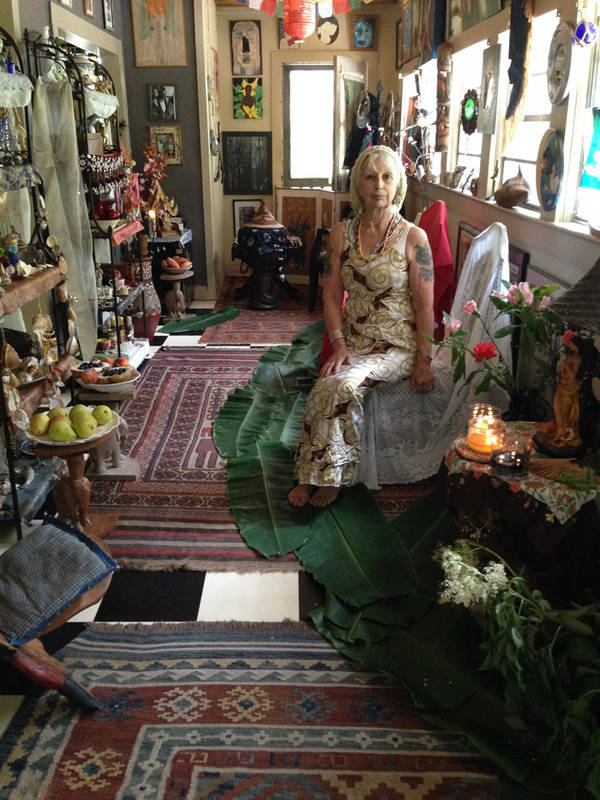 As a Priestess of New Orleans Voodoo, I find it essential to maintain a sacred space, a living, fluid and active Temple in my home, a specific room set up with the altars to my Spirits. A recent photo features an overall view of my powerful temple room. But the temple is truly more: it serves as the energy center of my home and the acre of land which I have landscaped and nurtured for many years. The whole has been consecrated through many rituals and prayer services as the Madre de Agua Spiritual Temple. The acronym MAST: that which holds the sails as we go through this journey of life, propelled by the winds of change whether they are calm or stormy. The MAST must be strong and securely anchored in right knowledge and foundation to provide stability and security for the vessel on which we are moving through the course of destiny, our earthly life. MAST is also the Poteau Mitan, that vertical element through which the Spirits' presence flows down from skies to earth, the axis where the parallel universes may interact. The MAST keeps us centered and connected above and below while it allows us to move forward. It steadies our steps. I have chosen to transform my humble domain into a temple instead of public-view altars ( I have no retail establishment!) but then I do not go elsewhere to work or pray, I live next to and with the Spirits at every moment. Whatever happens in my home, everyone of my actions, emotions and thoughts is also Their business and all must be taken into account. This is a 24/7 relationship that remains undiluted by outside energies. Therein lies its strength. Beginning on the left the photo of the temple room shows 2 sets of altars each with an Obatala altar at the very top. The closest set of shelves also includes a Yemaya altar and several levels of Oshun's altars. The second shelf is topped with another Obatala altar, then Chango and Oya, then an altar to Queen Marie and an altar to Maximon closest to the floor. These two sets of shelves which flank a doorway to the rest of the house are followed by a large clay urn which contains Queen Marie's 'implements" (rain stick, staff etc..) then the Dragon drum dressed in its covering of batiked cotton and topped with my Dogon hat. Further on, still on the left is the Ancestors' altar set on a black lacquer Chinese cabinet surrounded by portraits of Ancestors on the walls, opposite and above. Farthest and straight ahead is Queen Marie's chair with Herself sitting on a tiny wicker 'queen's fan chair" under a decorative red silk umbrella. Her chair is brown/black animal print. No one ever sits on Queen Marie's chair! Her chair is framed to the back with an oriental half-screen that features four panels, two with white magnolias and two with blue flag iris, these being favorite native medicinal plants of Louisiana. To the right, under the seven windows is a stool in matching animal print: this is used by clients who come for a reading or cleansing/blessing ritual. This stool is flanked on each side by two small tables, each one with four elephant stools. These tables and stools are used for auxiliary altars and placing of offerings on feast days and for special rituals. Each window sill is set with sacred items that serve as complements to the altars facing them or are mini-altars of their own. At the very front left, a bit of the white wicker chair appears: it is the Ancestors' chair, which I sometimes use when doing a reading or leading a ritual. At the very front right side - remaining unseen - is a set of 5 altars which include Black Hawk / Saint Kateri, Eleggua, Babalu Aye, Ochosi and Ogun. These can never be photographed and are correctly placed behind the entrance door. The walls of the temple room are covered with artwork, many of my own paintings as well as other works representing the Spirits, and sacred items belonging to Them. The floor is partially covered with Eastern rugs which convey my own background and the color scheme of blue and red favored by the Spirit Warriors. The black and white floor is typical of temples. The MAST also comprises many outdoor altars, some which were readily apparent when I took over the property and some which I created. Ornemental bushes, ponds, trees and medicinal plants all have been planted and cultivated with the position of the altars in mind so that a pleasing balance is achieved and the overall ACHE of the land is accrued. Below are photos of the M'man Brigitte altar (with candles lit, nearing Her feast day) and a recent photo of the Ogu shelter. In front of this shelter recently offered: a red banana tree and a key lime tree in large green and black clay pots, a small avocado tree, living offerings to the Loa. A fire circle is set directly across from the Ogu shelter at the other end of the meadow/orchard and is used in all Gypsy rituals and fire-offerings. A Buddha keeps the peace, overlooking all and sheltered by two creeping bitter melon vines (another medicinal plant). I have been known to set up a temporary shelter for an evening sweat lodge during special phases of the Moon. The meadow/orchard is ringed with plantains, elderberry, privet, magnolias, white oaks, wisteria, honeysuckle and more...All are sacred to the Orisha and Loa and their leaves or flowers are used in my spiritual baths. I endeavor to maintain a beautiful sacred space to the Orisha indoors and to the Loa outdoors, while striving for peace, balance and grace in all. This is in keeping with the Spirits who 'rule my head". This is in keeping with the tradition of New Orleans Voodoo and the many regional old world traditions that came to enrich it over the centuries. This is my daily work. In another part of my home are beautiful altars to Ganesh, Radha-Krishna, Saraswati, Lakshmi, Shiva and the Buddha and Tara. Again pictures and paintings of Devi and Gurus enliven the space. For the Hindu and Buddhist altars I was blessed to find an inlaid cabinet from India and another carved cabinet of mango wood in a most pleasing teal color. 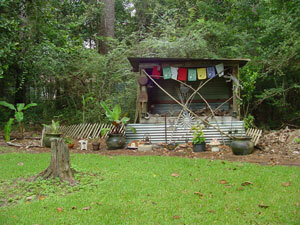 This part of the house is used for my private meditations and retreats as well as for Reiki consultations and sessions. Thus the MAST is rooted in the land, the living plants, the harmony of cultures and sacred traditions through their colors and the sacredness of objects and offerings while maintaining the lifeline true to New Orleans Voodoo and the living Spirits of our beloved Louisiana. The balance and beauty, the pleasing sounds of dozens of wind-chimes and hundreds of birds underscore the rhythms of my days. The Temple room is open to visitors who seek spiritual guidance in the form of a reading and/or spiritual services, by appointment only. We perform Rituals of Offerings and Prayer Services for clients, from the simple to the very elaborate and esoteric. A prior reading is always required: by phone or in person. The Madre de Agua Spiritual Temple offers private and confidential readings with the Tarot or Bones & Shells. Must be booked at least two weeks in advance. To book Tarot readings over the phone (1/2 hour or 1 hour) please go to the Consultation Page. Must be booked at least two weeks in advance. NO Bones & Shells readings by telephone, in person only! Remember: for all readings in person, you must come to us in Lacombe Louisiana about one hour north of New Orleans and keep your appointment promptly. NO refunds on cancelled or missed readings! Note!! To book phone readings (1/2 hour or 1 hour) please go to the Consultation Page. Each ritual of Offerings is tailored to the individual client, after a reading has been done to determine the true nature of the situation as well as the specific spiritual work that will be most beneficial to the client. NO spiritual work will be undertaken without a prior reading although the reading can be done by phone. All ritual works must be booked a minimum of 2 weeks in advance with a deposit. ALL READINGS AND SPIRITUAL WORK ARE PERFORMED BY OR UNDER THE DIRECTION OF REV. SEVERINA AND REMAIN STRICTLY CONFIDENTIAL. The Madre de Agua Spiritual Temple accepts donations towards the set year -round Rituals of Offerings to the Archangels, Loa, Orisha, Deities and Saints from many traditions which we celebrate during the course of the year. FEBRUARY - 2 - OYA: Mistress of the Cemetery. ( For change, readying for battle, protection from winds.) M'MAN BRIGITTE: Mistress of the Ancestors (for re-establishing fairness, blessings and protection from familial ancestors, light for souls lost to us while still young, positive changes in relationships). JUNE - 21-23 - Summer Solstice - LEGBA - St John's Eve - John the Conqueror ( To celebrate the summer, the warmth, fire and nourishment from the Sun. ELEGGUA and WARRIORS: For opportunities, good luck and to re-align oneself with cosmic forces). QUEEN MARIE LAVEAU: (celebrating Her rituals and Her traditions. 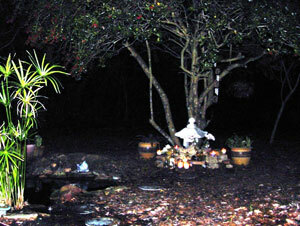 To obtain Her blessings and protection) Honoring the 400 year-old tradition of New Orleans Voodoo. JULY - 14 - SAINT KATERI : Patron saint of ecologists and environmentalists. Prayers for balance and preservation of the earth resources and all sentient beings. Was just cannonized December 2011. AUGUST - 2 - BLACK MADONNA: Virgin of the Angels. For solace, protection, fertility, to give up one's sorrows and for protection of mothers and children.) 16 - Feast of ST.ROCH: patron saint of dogs and those who love them. St Roch is associated with the great healing Spirit BABALU AYE, whose feast day is also celebrated on December 17th. OCTOBER - 4 - ORUNMILA: (For divination, psychic powers, prophetic knowledge) 24- ERINLE: (For healing all ) 31- Halloween ( to make hallowed before the rites of the Ancestors - to dispel evil forces through disguise and subterfuge) 28 - MAXIMON - Spirit from Mexico who helps bring riches in particular silver to those who keep an altar to Him. Has been synchretized as Saint Simon. We celebrate the Spring and Autumn Equinoxes, the Winter and Summer Solstices with Rites and Offerings as well as the monthly New Moon and Full Moon. Spiritual baths (herbs and flowers) and Flower Essence baths can be made for clients at the close of each ceremony, per demand only and subject to specific offerings. with your inquiries regarding the Madre de Agua Spiritual Temple, prayer services and donations for spiritual or flower essence baths.